If you’ve ever wanted the perfect game to entertain a child for hours on end, it’s time you took a look at 4 Elements [Broken Link Removed]. The casual game by Playrix is both incredibly easy to play and strangely addictive for kids and adults alike. There’s a grand storyline, which pulls together the different puzzles of the game into a cohesive whole, but at the core of 4 Elements is an incredibly addictive casual game. This is what you spend the most time playing and what will keep you coming back for more. We’re giving away free copies of 4 Elements to lucky readers this week valued at $500 (it normally retails at $19.95 for the premium PC/Mac version). So, find out more about the game by reading this article and head to the bottom of the post for details on how to enter the giveaway. The story behind 4 Elements [NO LONGER AVAILABLE] itself is very kid-friendly: There’s a kingdom in trouble because the magic four elements have been corrupted by an evil force. You need to restore the kingdom to glory by unlocking four ancient books of magic and collecting 16 cards. But that’s just the story that keeps it all together – there’s so much more to it. The four ancient books divide up the four stages of difficulty in the game. There are four cards to be found within each stage and these have a matching game to be played for each of them. There are also times where you need to play a mini-game searching for objects in a room in order to progress. Check out this video of 4 Elements in action to really get a feel for it. Kids Will Love 4 Elements – And So Will You! The graphics in 4 Elements are quite detailed at times and really work to pull the main story of the game back into the foreground. Kids will love the fantasy characters and beautiful introduction. As the game is simple to start, it’s easy to get kids playing by themselves. A friendly fairy will introduce the player to each new tool and difficulty as they become relevant, so players gradually come to know more about the game and get better at it. It’s a game which can be played by kids who don’t have a lot of co-ordination yet and who aren’t yet very good at games – and it will help them to get better! It takes quite a bit of playing before the time-limit becomes a problem for even the slowest player. The 4 Elements game is available in multiple formats for a variety of operating systems and also online. 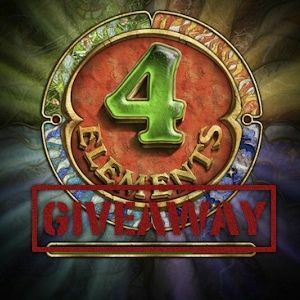 We’re giving away 25 copies of 4 Elements for both Windows and Mac platforms. Join the giveaway to be in the running to win one! Explore more about: MakeUseOf Giveaway, Puzzle Games. This is great to have another free game to win it. Looks fun, I wouldn't mind giving it a try. I want one for my nephew. no need in this, as far as i don't have kids, i wish everybody good luck! I already have it and it is a really good game! Sure to keep you on your toes and amused for a while! My Nephew will like it!! Looks pretty fun. Do I 'have' to share with my kid? Still think I'm a kid so I want 4Elements. Terrific post, indeed. Numerous thanks to the author! Moreover, I like it so much that I decided to advertise on your site next month... Please e-mail me your advertising rates at your earliest convenience. I'll pass your details on to Aibek and you can chat to him about it. Thanks! This game has amazing reviews, we would love to check it out! Thanks for the chance! This game has amazing reviews, we would love to try it out! Thanks for the chance! My wife is a kid at heart & would love these games.